Looks easy, doesn't it? 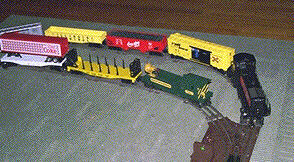 But when you have four trains running at once, things get a bit "touch and go" with the switching. Here's a little fun we had using our own rail operations. 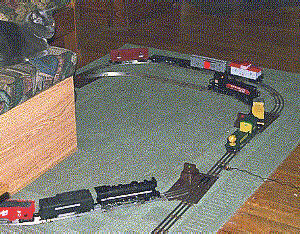 The maintenance train moves out past a short freight. The outside freight train has the green light. 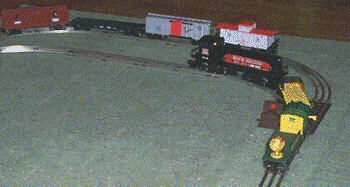 Outbound freight disappears, the "Trollwise Special" waits on siding while the MOW enters the mainline. Our "Train Runner Passenger Specials" have one coach and one caboose. 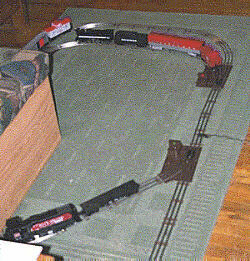 Railbox operating brakeman boxcar - cool!